The EL (Equilibrium Level) is the upper boundary of the most significant region of CAPE in the troposphere. It is the point at which a buoyantly rising parcel of air will become equal in temperature to that of the environmental temperature. Once a parcel of air rises to the top of the CAPE region it will reach a point at which the density of the parcel is the same as the environment. 2. How is EL determined? 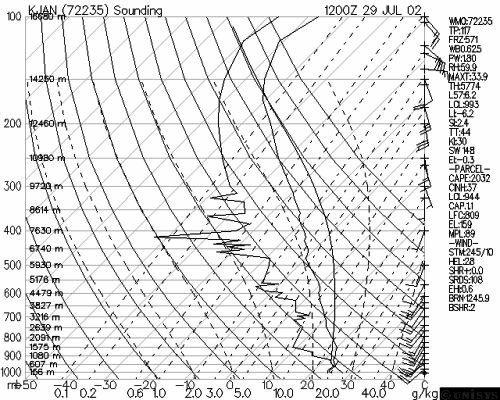 Find the region of CAPE on the sounding. The pressure level at the top of the CAPE region is the EL. The EL on the sounding below is at 159 mb (notice at this pressure level that the parcel temperature and environmental temperature are the same). Deep Convection: A high EL will allow storms to build high into the troposphere, especially if the CAPE is large below the EL.